The new collection theme is formed with the concept of a print media object and acknowledging the environment it is displayed in. 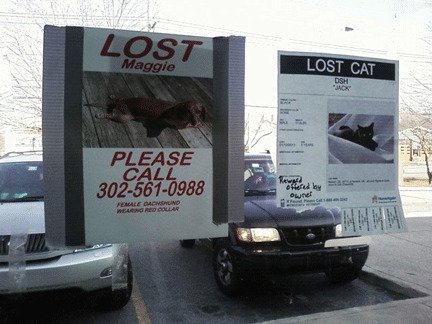 The Public Bulletin Board Collection will consist of digital images that visually represent different locations of notice boards presenting paper pamphlets. This text on the new collection theme, Public Bulletin Board Collection, will introduce the collections concept, the participant’s contributions to the collecting process, and how types of media are involved in the process. The bulletin boards are a public display of a collection of various forms of print media. The types of print media can include flyers, posters, or business cards. The public bulletin board offers a tangible space to communicate details concerning events and opportunities. 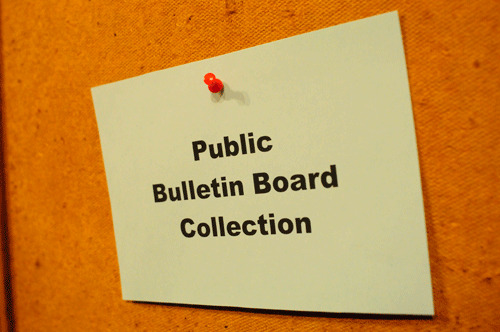 The Public Bulletin Board Collection theme examines some of the broader contexts that are currently being research within my “Collection” project. Some examples are: the transition of print media, public access to the collection, and participation to the “collection” project. These examples will be investigated through the type of collecting process used with this theme. The central point of the collecting process is based upon participation from the public to submit digital images of a public bulletin board in their residing area. Participants of the collecting process are presented with submission guidelines on the website that enable them to contribute to the collection. Participant’s names are not presented on the webpage with their image. Rather the location information (city, state, and country) emailed with the image will be display on the Public Bulletin Boards Collections webpage. The location information about the bulletin board contributes to the collection theme, instead of the personal information about the participant. These emails will be archived as part of the collection background information. Olga Goriunova references that using media, as an art platform becomes a “self-unfolding mechanism” that enables the development of contemporary aesthetics on the internet. She describes the direct subjective and societal involvement with the aesthetic practices that occur. By following the direction of the effects of these relationships with media, she presents these concepts to be considered with the engagement of digital technology as a tool, as a context, as a metaphor, as an agent, and as culture-at-large. I will refer to these five concepts as preliminary investigations, since the Public Bulletin Board Collection is in the beginning stages in using digital technology. Website templates are used as the main tool to present the visual representations and texts concerning the collection. The advantage for me to employ pre-designed web pages is the accessibility to add content from a continuous collecting process. The templates offer organization methods of media content, but do have limits on expanding online exhibit interpretation. For this preliminary writing, I am grouping the concepts “as a context” and “as a metaphor” together. Further development of the Public Bulletin Board Collection collecting process will acknowledge the future direction of each of these concepts. Presently these concepts are the structure and symbolization of the internet being an intangible exhibition space. Public access to this collection theme has been expanded from viewer to a contributor of the collecting process. Various forms of media supply the agency for a participant to contribute to the Public Bulletin Board Collection, along with following the collections growth. Digital images are the main focus to the collecting process. Participants have a variety of methods with digital technology to take images. Such as: a digital camera, a smartphone, or even an “ipad.” The images are then submitted by electronic mail, email, for the collection. Email is the digital communication medium used between the participant and myself. This is not just for the attachment of the digital image, but the body of the email is used to submit the location of the bulletin board and the terms of release to publish the content publicly. After the process of submitting and posting the content to the collection web page, the participant has the option to follow the collection with social media. Social media sites, for example Facebook, are posted on the homepage to follow the progress of the “Collection” project. 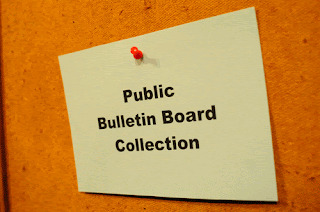 The Public Bulletin Board Collection acknowledges an active participant role, by contributing to the collection, and a passive role of following or viewing the collection as a whole. The last concept, as culture-at-large, which refers to the development of contemporary aesthetics on the internet. I will be investigating this concept in broader terms of the project’s internet presences. In the publication Rethinking Curating, Beryl Graham and Sarah Cook examine the short history of “new” media art and pose questions toward this art canon’s future development. Their question is “Is new media art a result of postmodern culture, or does it exemplify our postmedium condition?” These questions will be examined further by initiating research with my “Collection” project through the stages of involvement with media and interdisciplinary methods. The Public Bulletin Board Collection intends to mobilize participants with their everyday digital objects in the collecting process. These preliminary investigations will begin to unfold the engagement of these relationships with media. I begin the collecting process with my contribution of a digital image of a community bulletin board located outdoors in my area of residence. For the guidelines to submit to the Public Bulletin Board Collection visit this webpage. The sections offer an acknowledgment of how documenting these roles expose multiple perspectives before the staged recording process of the video clip for the collections. To view the Trimming of the Mustache video clip from the February 2013 Recent Additions of the Mouth Collection please visit the website. The printed object being observed is a flyer. These multiple printed pamphlets are intended for mass distribution for communication purposes. Rather than focusing on the flyer as a print object this post will begin to inquire about the public space needed to “post” the pamphlets. My observations of two examples of flyers are in the lobby area of a public institution, the Post Office. The image with this blog post presents the flyers taped directly to the lobby windows. This area has become a makeshift public notice board, since the post office bulletin boards have locked glass doors and do not have public access for posting pamphlets. There are accessible public bulletin boards in my community. There locations range from cafés, community centers, and open air structures on the street. The community is in a suburban area. Typically the flyers are “posted” on a bulletin board instead of given out by hand, like you might see in a heavily populated urban area. This post is not intended to promote makeshift public notice boards on institutions property. The writing is part of the investigation of various modes of public access to communication systems through print media and social media.